Posted August 8, 2013 by Joel Goldman & filed under writing fiction. All the controversy and hand wringing surrounding the JK Rowling pen name debacle got me to thinking about pen names. 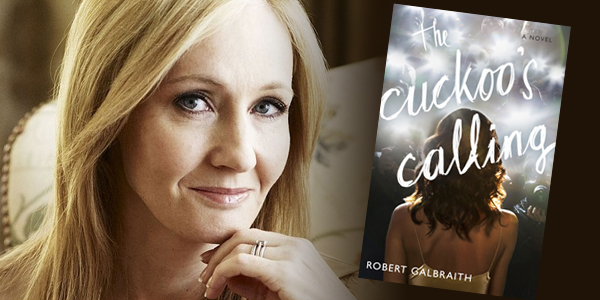 Did you realize that even before Rowling wrote The Cuckoo’s Calling as Robert Galbraith, she used a pen name? According to her website, her official name is Joanne Rowling, but she chose to write under the name J.K. Rowling on the advice of her publisher. He thought young boys might not want to read a book written by a woman. Officially, she has no middle name, but chose to use ‘K’ to honor her paternal grandmother, Kathleen. Rowling says she used the Robert Galbraith pen name so she could return to the beginning of her writing career without all the hype and expectations. My good friend, Lee Goldberg, wrote under the pen name Ian Ludlow for his first four books, published while he was in college. Lee writes books and television shows. One of his most notable television shows is Monk. He’s also written many books, including The Dead Man (a monthly series), The Walk, and Watch Me Die. Personally, I think that’s pretty smart thinking for a college-aged kid. He goes on — “I picked “Ian” for Ian Fleming. I figured people would go ‘Ian Ludlow, hmmm, the name sounds so familiar. I think I read something by him before and it was good’.” Lee told me that the publisher wanted the option to continue the series if he ever bowed out. This way, they could continue the on without anyone ever knowing Lee was gone. George Orwell – his real name is Eric Arthur Blair. He used a pen name to save his family from embarrassment from his stint of poverty. He chose ‘George’ because of his love for England. St. George is the patron saint of England and he loved to visit the River Orwell. Voltaire – his real name is Francois-Marie Arouet. Arouet lived in a prison cell in the Bastille in the early 1700s when he wrote his first play. As a symbol of his leaving his past and breaking ties with his family, he signed the work using a pseudonym of Voltaire. Agatha Christie – her real name is Agatha Mary Clarissa Miller. She wanted people to easily remember her name. To complicate matters further, she also wrote romance novels using the pseudonym Mary Westmacott. Stan Lee – his real name is Stanley Martin Lieber. He wanted to save his real name for highbrow literary work after he got his career going writing comics. But, once he became so famous for his comic books, he had his name legally changed to Stan Lee. So, you see, there are lots of reasons for using a pen name. It really has nothing to do with dishonesty (or shouldn’t, anyway). While I have no problem with authors using pen names, I haven’t used one and doubt I ever would. My relationship with my readers is too important for me to use another name. In fact, the lead character in my Jack Davis Thriller Series has the same rare movement disorder I have. You can get to know Jack and get a look into his dangerous world as he investigates crime by grabbing a copy of Triple Threat – a full set of all three novels in the Jack Davis series. Many authors have published books with a co-author in recent years. James Patterson does as does Clive Cussler and Janet Evanovich and many more. 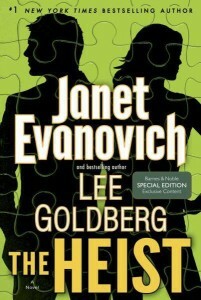 In fact, the prolific Janet Evanovich just co-authored a fantastic book with my friend Lee Goldberg entitled, The Heist. I asked Lee about the pros and cons of co-authoring and he says that he loves the creative challenge, the fun of working with someone else rather than being alone, and the chance to broaden his fan base. But that’s only the beginning. As far as the cons of co-authoring go, Lee says that if you’re used to writing on your own, what you write might not fly with your co-author. “Your decisions will be second-guessed and you are likely to be rewritten. You might think you have a great notion for a plot move, but if your co-author disagrees you have to find a compromise,” Lee says. And he reminded me that, of course, you have to share the money! What are your thoughts on authors using pen names? What about co-authoring? Do you read books by famous authors where they co-author with a talented, but lesser known writer?